In the world of LEGO, there are people known as Master Builders: folks who can take a random pile of bricks and parts and turn it into a unique construction. As utility operators face daunting challenges, such as upgrading their grids to better integrate renewable energy, there's a lot they can learn from these Master Builders. Whether they realize it or not, most Master Builders are embracing what in software development is known as the agile approach. It focuses on quick deliverables and fast learning rather than time consuming perfection. When something doesn't work, pivot. When something succeeds, persevere. In software development, the “agile” approach helps developers get to a better app. 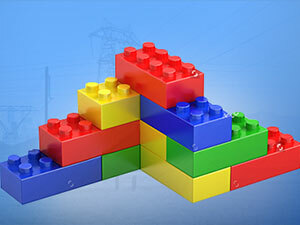 In LEGO brick building, it determines whether your construction will be a car or a bunny. And in the world of energy, it can help utilities tackle their biggest challenges. The world needs more energy. The International Energy Agency (IEA) estimates that in order to keep up with demand, $20 trillion will need to be invested in power and grid technologies over the next 25 years. Much of that growth is expected to come in the form of renewable energy which, according to a recent IEA report, will represent the largest single source of electricity growth over the next five years (rising to a 26% share of global generation). Utilities are struggling with the increasing challenge of integrating renewable energy sources into the grid. Integration can conflict with existing modernization and optimization plans. Issues of reliability, safety, power quality and economics have to be taken into account. There isn't a one-size-fits all solution here. Every utility faces unique challenges in response to extreme weather events, to aging infrastructure and the evolving political landscape. There are plenty of LEGO brick sets that come with exactly the right number of bricks and a well-illustrated instruction manual. But that's not how Master Builders work. To deal with their biggest challenges, utilities need to think like Master Builders and become more agile. 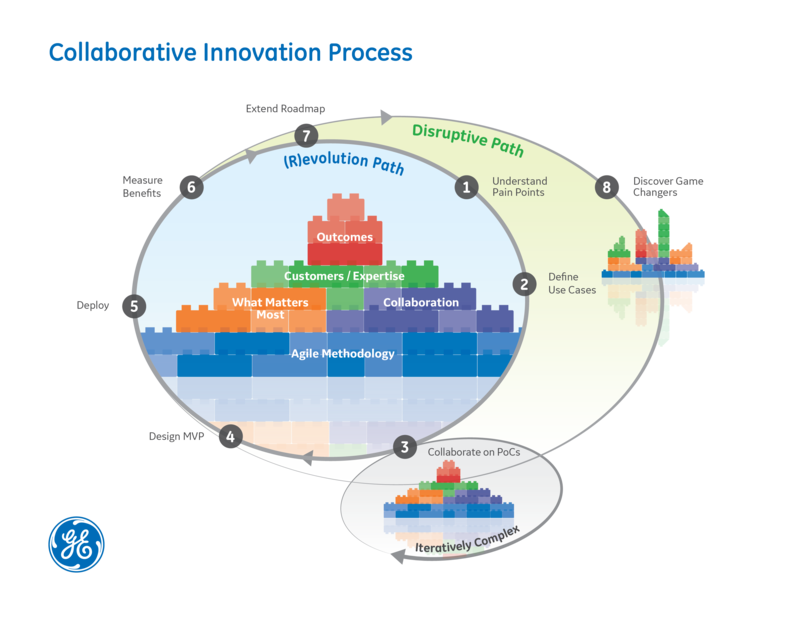 The diagram above outlines GE's collaborative innovation framework that uses the agile methodology to solve utility grid challenges. The process begins by assembling a team to understand the pain points — what are the challenges that need to be addressed? The team then works to develop use cases that highlight those challenges and what is required to meet them. Any capability that requires advances beyond the standard solution is incrementally proven using agile techniques. These Proofs of Concept (PoCs) lead to a Minimal Viable Product (MVP) design, which is then deployed and tested. Then, the team moves forward, measures the results and incorporates that learning into the utility's roadmap. This cycle repeats and eventually, the team will discover solutions that can be truly game changing. GE developed the framework at the company's Digital Solution Lab in Melbourne, Florida. The lab is a digital clinic where GE works with energy customers and collaborators to develop fast and affordable responses to problems around grid modernization. The lab operates on the ideas of working more closely with customers, finding new ways to deliver value, pushing cultures from imagining to doing, delivering fast results with small teams and enabling people to do their best work. The team at the Digital Solution Lab uses the innovation framework to help customers better understand their emerging operational challenges. They collaboratively map these challenges into a ranked series of critical use cases. Teams then create and deliver a set of PoCs that offer clear and measurable deliverables to help solve the different problems. Each PoC progressively increases in complexity, each with a targeted duration of six to eight weeks, ultimately informing the design of incremental MVPs. This approach provides customers with tangible value in an affordable and timely fashion while preserving pivot options and ensuring a path of least regret. Current PoC focus areas include: diagnosis and prognosis of aging grid assets and long-term asset care services, increasing penetration of distributed energy resources, and physical/cyber security, among others. The Collaborative Innovation Framework and the Digital Solution Lab are part of an agile engagement that lends itself to continuous improvement and ultimately the development of game changing solutions. For utilities facing revolutionary challenges, it can be an effective way to tackle grid modernization. And while it might not actually be as much fun as playing with LEGO bricks, by adopting the holistic thinking of a Master Builder, your team can help create transformative solutions.